Let’s say you’re craving cookies. So you ask the boy what he wants. And he says oatmeal raisin. 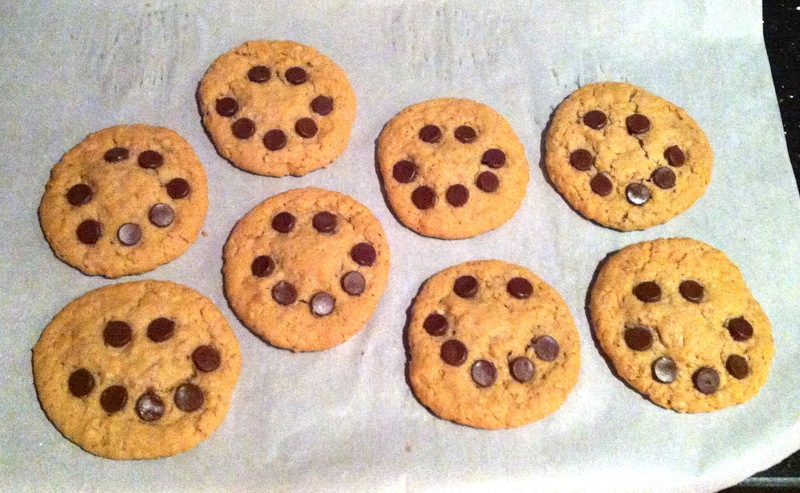 So you decide to make oatmeal raisin chocolate chip, because (as you know) everything’s better with chocolate. Now let’s say you ask that boy to run to the grocery store for you and pick up raisins and chocolate chips, among other ingredients. What do you think will happen? Instead of coming back with raisins and chocolate chips, he comes back with raisinets “because they’re cheaper and amazing.” At first I was appalled – that’s not what I requested! But then I realized his genius: not only were chocolate-covered raisins cheaper than buying both raisins and chocolate chips, but also you get a perfect pairing of chocolate and raisin in every mouthful. No more will you bite into an oatmeal cookie only to get loads of raisins and no chocolate, or vice versa. No, sir! These cookies have the perfect distribution of the recipe’s key ingredients. Believe me: it shows as soon as you dig in. 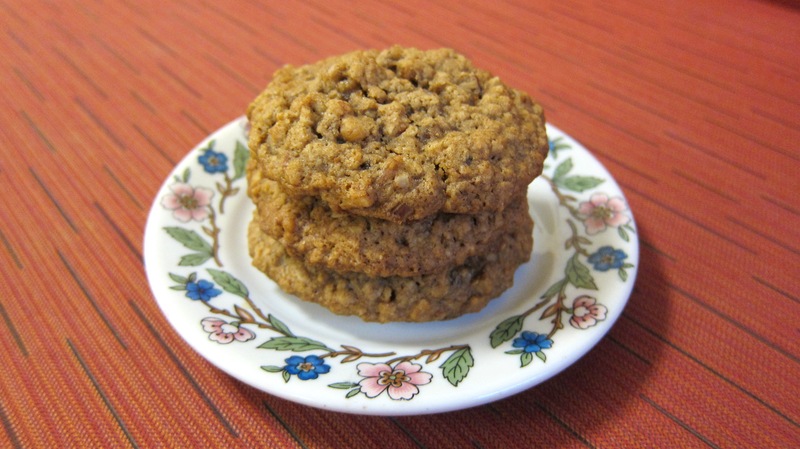 Add the extra spices and instant coffee to highlight it all, and you end up with crunchy-on-the-outside-and-soft-in-the-middle cookies that are absolutely bursting with the best of the best flavors. 1. Preheat oven to 375 degrees F. In a medium bowl, whisk together flour, baking soda, salt, instant coffee, cinnamon, cloves, and nutmeg. Set aside. sugars until light and fluffy. Add the eggs and vanilla; beat until combined, scraping down the sides of bowl as needed. 3. Slowly add the flour mixture to the wet ingredients; beat until just combined. Stir in the oats, pecans, and raisinets. Not much more to say here, folks. 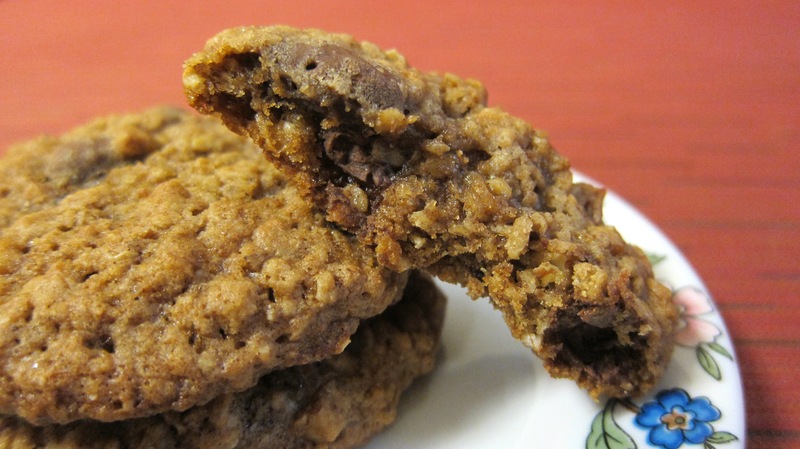 These cookies are nutty, crunchy on the outside, chewy on the inside, chocolate-and-raisin-y goodness, with hints of coffee, cinnamon, and spices. Absolument glorieux! 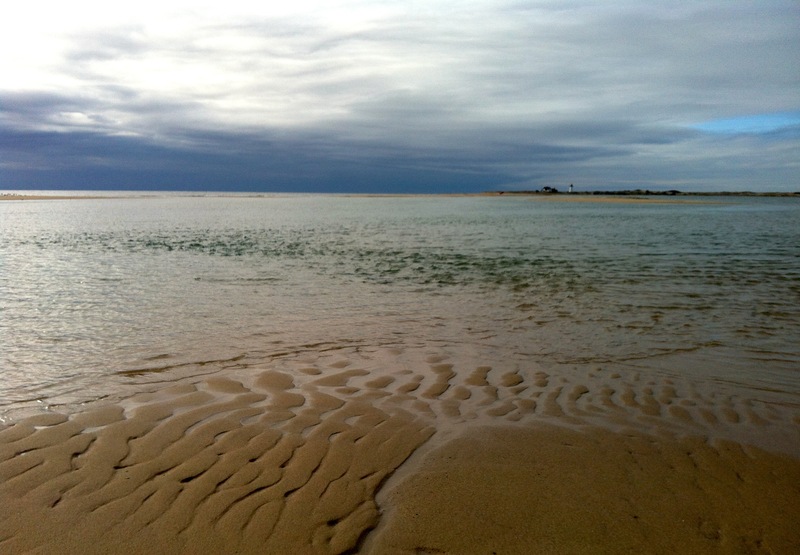 But we also explored the Cape for a few hours, walked along the beach for a few miles, and were fascinated by the water and sand ripples. 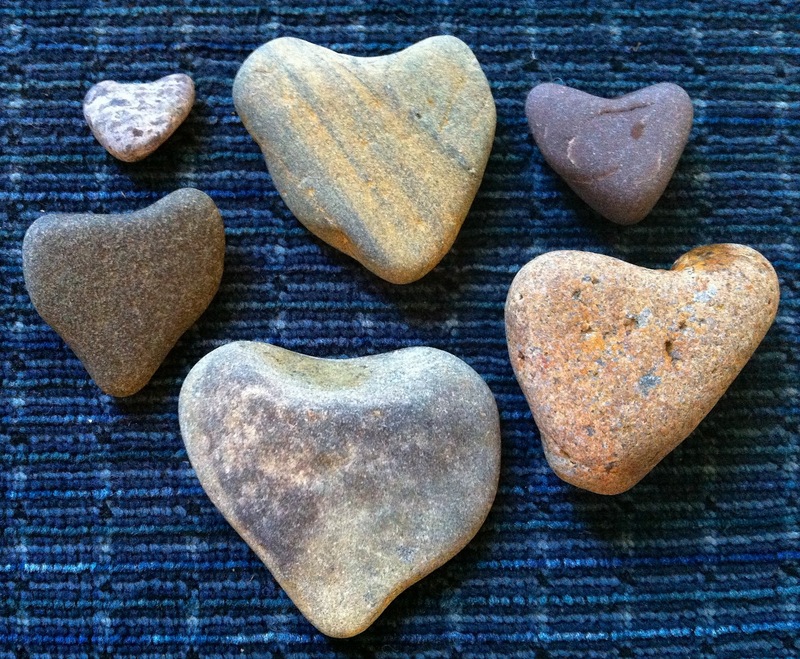 I even found a half dozen heart-shaped rocks! The hunt for these put me a good 100 yards behind Beth and Ellie for half of the walk… oops. But aren’t they just so darn cute?! A dinner of homemade lasagna and garlic bread paired with local Truro red wine (Beth and Ellie have amazing taste and culinary skills, in case you couldn’t tell), topped off with these dark chocolate chip salted caramel Nutella cookie bars for dessert was just what we needed to push through the last few days out here. Days that included unlocking and re-locking dozens of chained entrances. Days of moving very large and very heavy gas cylinders up and down an uneven sandy hill. And yesterday’s grand adventure: getting locked out of our rental house after they showed it to prospective buyers, thus having to break back in by climbing (horrifically ungracefully) through a window. All excellent excuses to savor our relaxed evening. Find yourself a similarly perfect excuse for making these. Did you check off a few key things on your “to do” list recently? Spend your entire day working up data or tweaking models on a computer? Finally tackle the pile of laundry you’ve been putting off for weeks? Arrive to work on time every day last week? Successfully breathe all day? Impressive, my friend, very impressive indeed. You need these. No, wait, you deserve these. You worked hard for it. I took this already perfect recipe from Two Peas & Their Pod and amped it up just a tad. 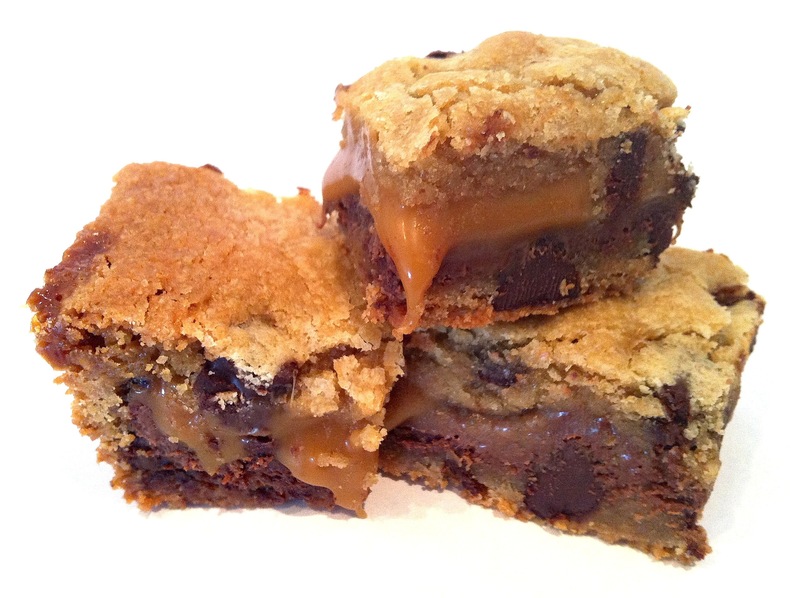 First, I switched to dark chocolate chips because I love the combination of salted caramel and dark chocolate. Second, I added Nutella because why would you ever need an explanation for adding Nutella? These are buttery. These are sugary. These are melty. 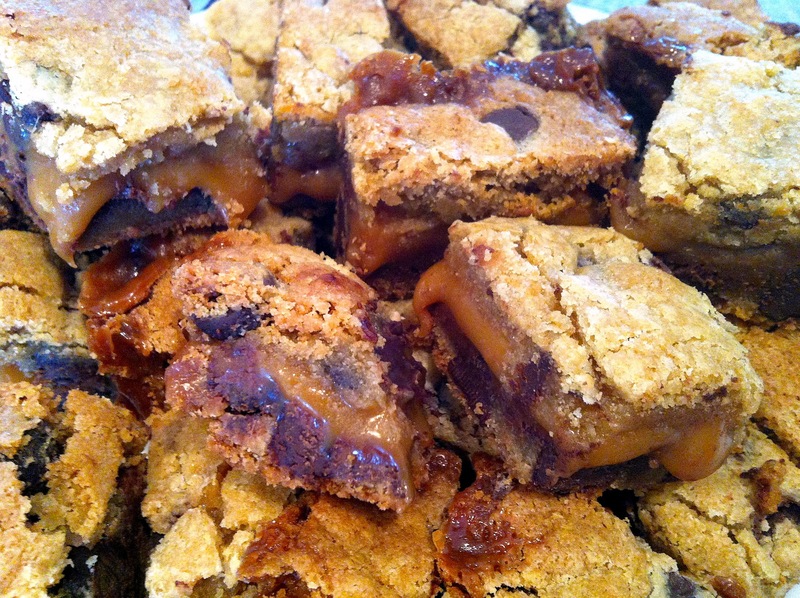 These are gooey and salty and sweet and chocolate-y and carmel-y and Nutella-y (those are all words) and basically everything you could ever dream of. Best of all, they are a cinch to pull together. The ONLY thing that could possibly be holding you back right now is lacking the right ingredients in your pantry. Otherwise, you should already be preheating your oven (325 F, but you scrolled to the directions a long time ago, didn’t you?). 1. Preheat oven to 325 F. Grease an 11×7-inch baking pan with nonstick baking spray or butter. 2. 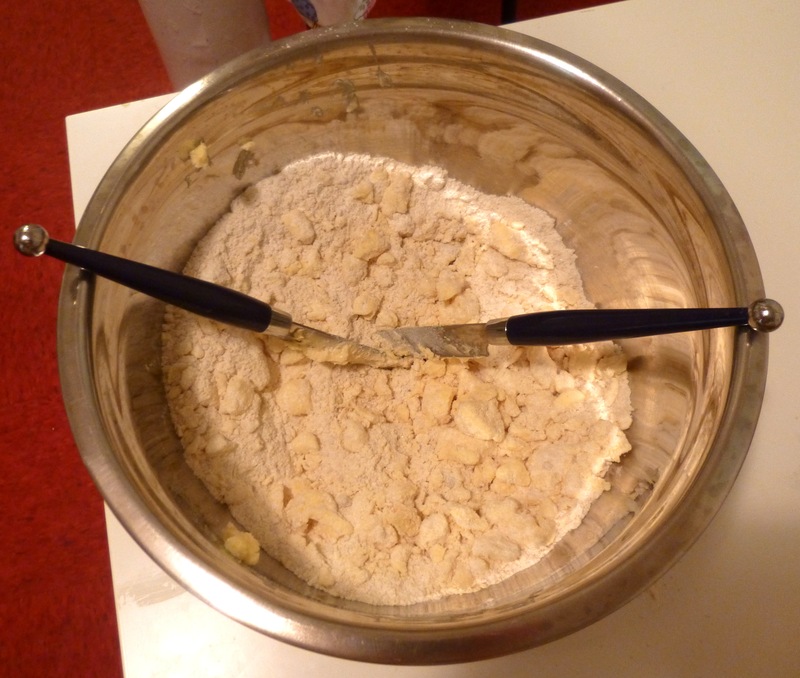 In a medium bowl, whisk together flour, salt, and baking soda until well-mixed. Set aside. 3. In the bowl of a stand mixer or using an electric hand mixer, combine the softened butter and sugars until well-mixed, at least one minute. Beat in the egg, egg yolk, and vanilla extract until smooth. Gradually beat in the dry mixture until just combined. Stir in the chocolate chips. 4. In a large microwave safe bowl, combine the caramels and heavy cream. In 20-second intervals, microwave caramels on High until they melt, stirring after each round. This should take ~2 minutes. 6. Take small portions of the remaining cookie dough and press flat with your hands. Place gently over the caramel, and repeat until you’ve covered all the caramel. Sprinkle the top with additional sea salt. 7. Bake at 325 F for 30 minutes or until the top of the bars are light golden brown and the edges start to pull away from the pan. Cool completely* on a wire rack and then cut into squares. Also, apologies that we’re back to bad photos for the day. My talented photographers are a few hours away! Many people will try to tell you how Valentine’s Day is pointless, worthless, or silly. But I ask you: if we didn’t have Valentine’s Day, how could I get away with packing this much pink, white, & red and this many hearts & sprinkles into one sweet treat?! People would think I was crazy or love-obsessed on any typical day for handing these out. But today it is perfectly acceptable to be a bit over-the-top. So I say, embrace the excuse to be ridiculous! Celebrate Valentine’s Day! Make these treats! Though you’ll want to thank me for this recipe, there is no need – I am sharing it with you because (1) it is Valentine’s Day and (2) this is my way of putting just a bit more love out into the world. Because these treats? These are love. The basic layout: sugar cookie + red velvet cake with cream cheese filling + sugar cookie, edge-dipped in chocolate and topped with sprinkles. 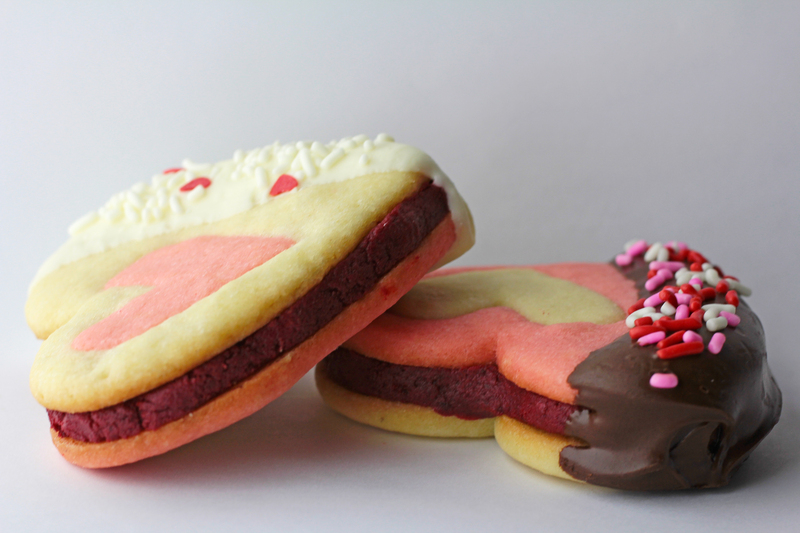 Each sandwich has one sugar cookie that’s white with a pink heart and one that’s pink with a white heart, so the sides are reverse mirror-images of each other, sort of like a sugar cookie ying yang metaphor for love. Yup. 1. Make cake according to instructions. 2. While the cake is in the oven, make the sugar cookie dough. In a medium bowl, whisk/stir together the flour, baking powder, and salt. 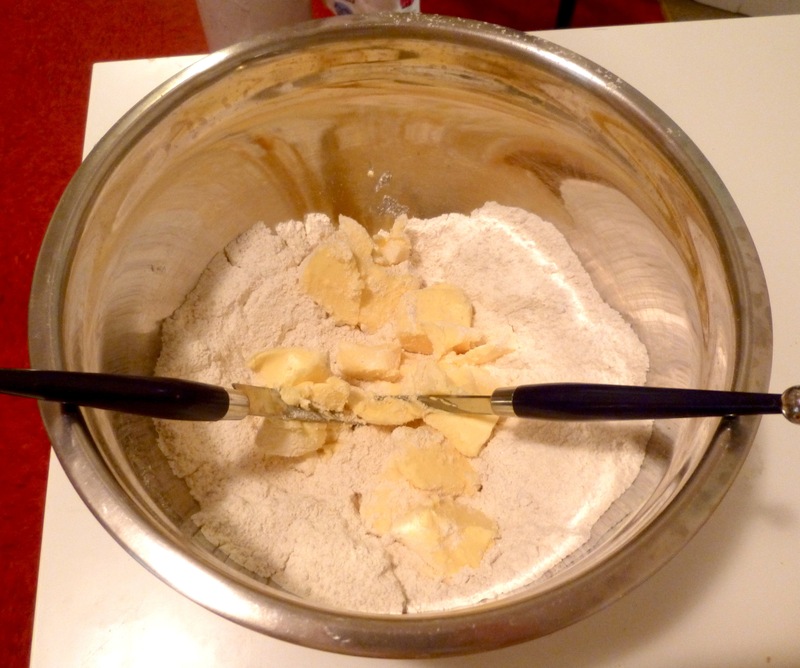 In the bowl of a stand mixer (or a large bowl + hand mixer), cream the butter and sugar together until fluffy. Add eggs one at a time, beating until well-combined after each egg, and then beat in the vanilla. 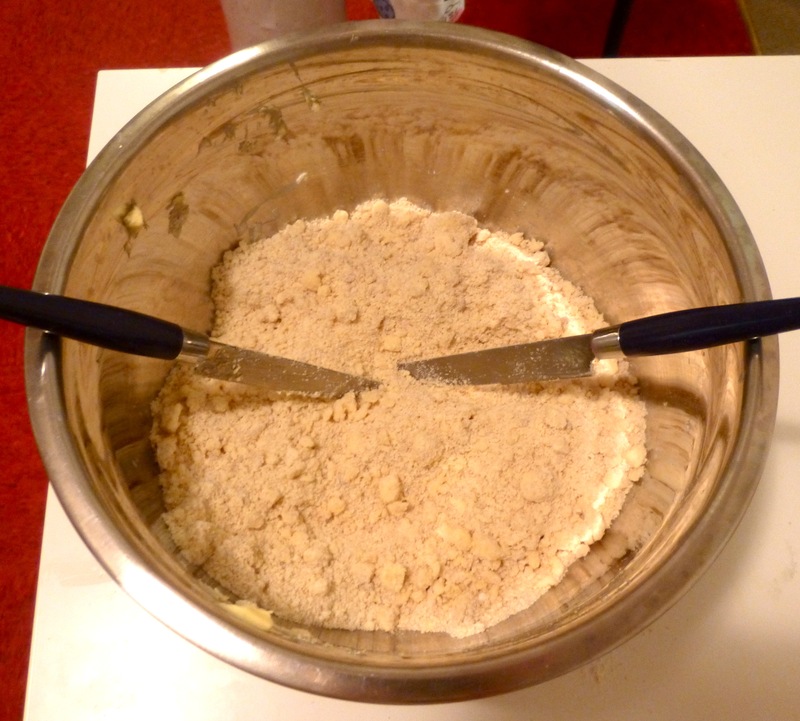 Gradually add the dry mixture until everything is well-mixed; scrape the sides of the bowl regularly. 3. Remove half the dough and press into a fat, round disk. Cover with plastic wrap and chill in the refrigerator for at least 2 hours, or overnight. 4. To the remaining dough, beat in red gel food coloring until you are satisfied with the color (keep it mind it will lighten slightly during baking). Press into a fat, round disk, cover with plastic wrap, and chill with the other dough. 4. When the cake is done, let it cool completely. If you are waiting overnight, cover with plastic wrap until you’re ready to use it. 1. Preheat oven to 350 F. Lightly grease a cookie sheet with baking spray. 2. Roll each chilled dough disk out on a floured surface to a thickness of slightly less than 1/2-centimeter. 3. 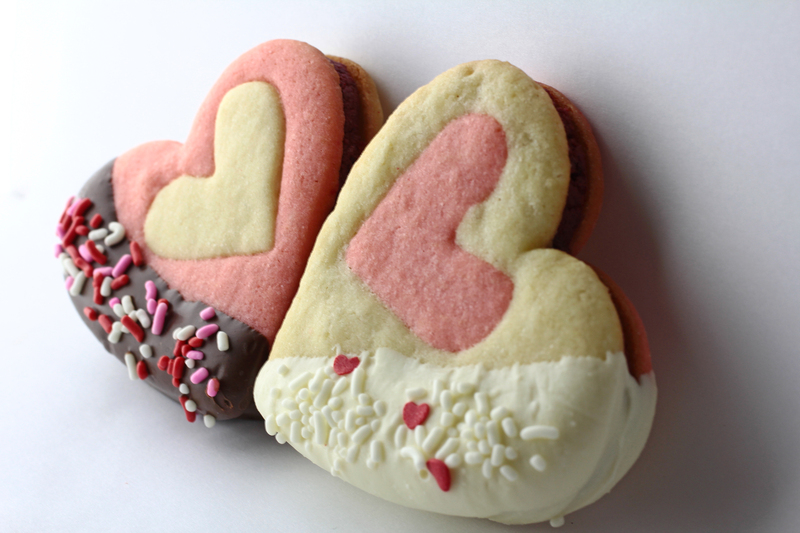 Using the large heart-shaped cookie cutter, cut out as many hearts as you can from both the pink and white dough, pressing the dough scraps together until you can’t make any more cookies. 4. 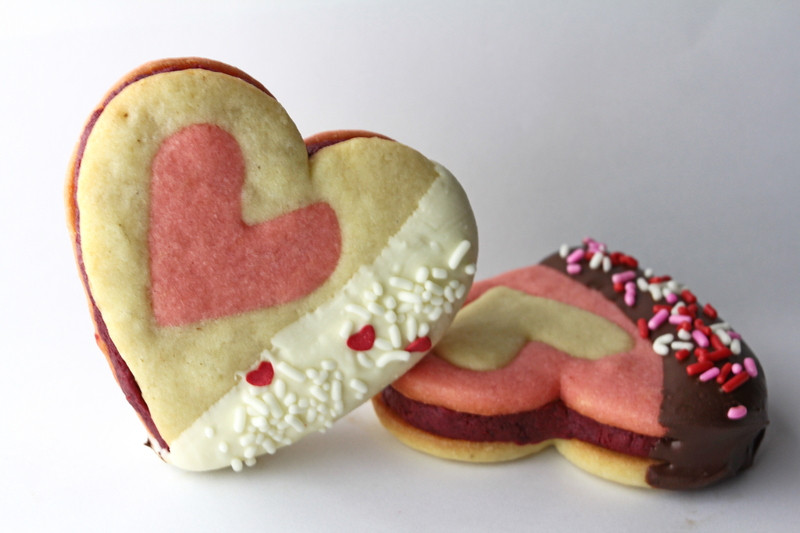 Using the mini heart-shaped cookie cutter, cut out small hearts from every cookie. The small hearts should be offset inside the big hearts, on either the right or left side. Make an even number of right- and left-side cutouts for both the pink and white doughs. 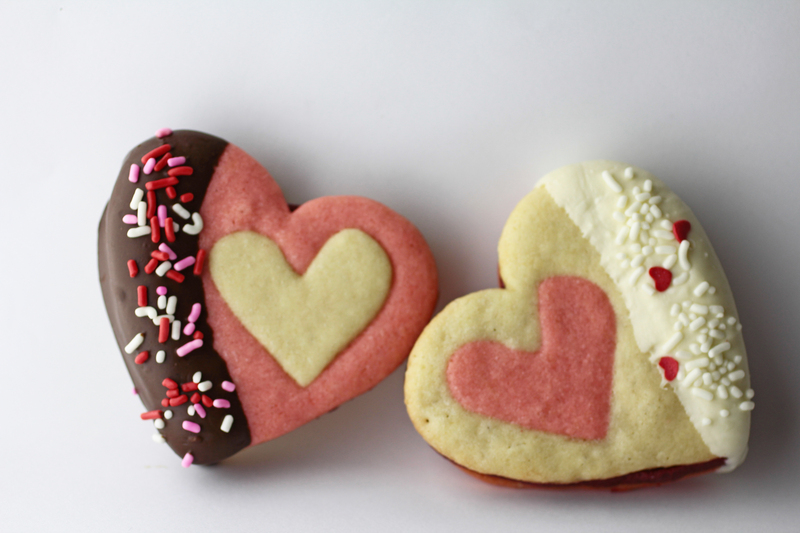 Swap hearts with the opposite colored dough and gently press the mini heart and the large heart together. 6. Cool on the cookie sheet for a few minutes and then transfer to a cooling rack. 1. Match up cookies of opposite color so that when they’re back-to-back, the mini hearts are touching. Do your best to pair up similarly shaped cookies. 2. 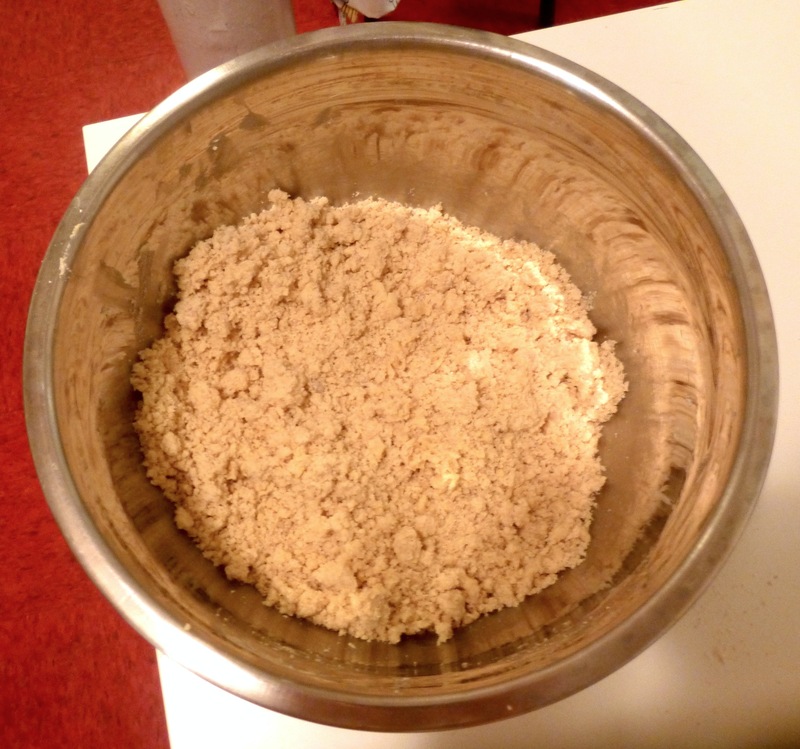 In a large bowl, crumble the cake and stir in the frosting until very well-mixed. 3. For each cookie pair, place 1.5-2 tablespoons of the cake mixture onto the bottom side of one of the cookies. Gently press the dough until it fills the whole cookie evenly, then top with the other cookie and gently sandwich together. 4. Chill the sandwiches in the refrigerator for half an hour or freezer for 15 minutes. 6. Dip in chocolate the side of the sandwiches that does not have the mini heart cutout. Using a spoon or the side of the bowl, gently scrape off excess chocolate. Make some sandwiches with the pink side face-up and others with the white side face-up. Set on wax paper to harden and decorate with Valentine’s Day sprinkles. 7. When half of the sandwiches have been dipped, repeat steps 5 & 6 with the other bag of chocolate chips. 8. 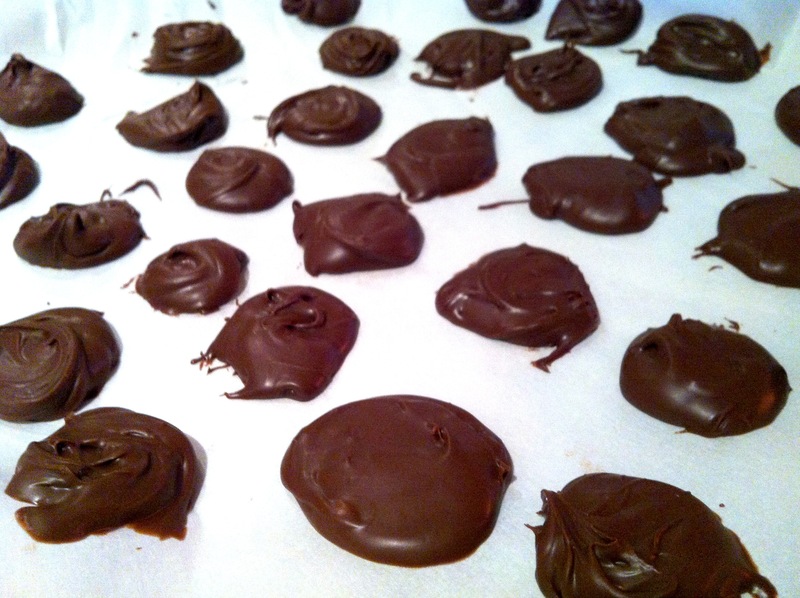 Do not store or stack until the chocolate has set; you may have to let them harden overnight. I recognize that this recipe has a LOT of steps, but it’s really not too difficult. You can do it! And they’re so, so good. 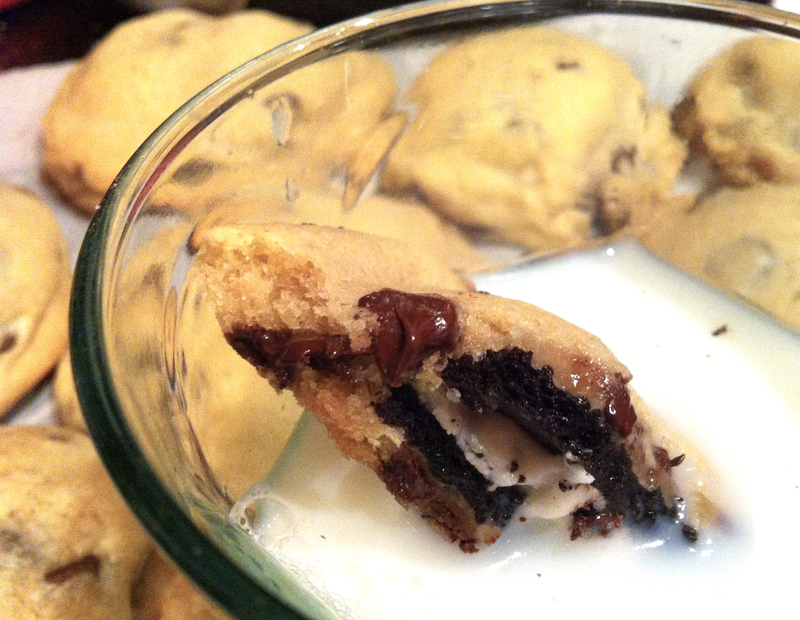 Seriously: make these. You won’t regret it! Also, did you notice how gorgeous these photos are? Robin and Ruby (two amazing people in my department) both told me that my photos had a lot of room for improvement (apparently iPhone photos aren’t good enough for them…). To help me step up my game, they both volunteered to share photography duty. So today, Robin conducted a mini modeling session complete with fancy lighting and a studio box and everything. My little babies, all grown up and turned into supermodels! Expect better photos from now on, folks: I’ve made it to the big leagues. I’ve got PROFESSIONAL PHOTOGRAPHERS!! Posted in Cookies, Uncategorized, You can't categorize me! Many things make me smile. 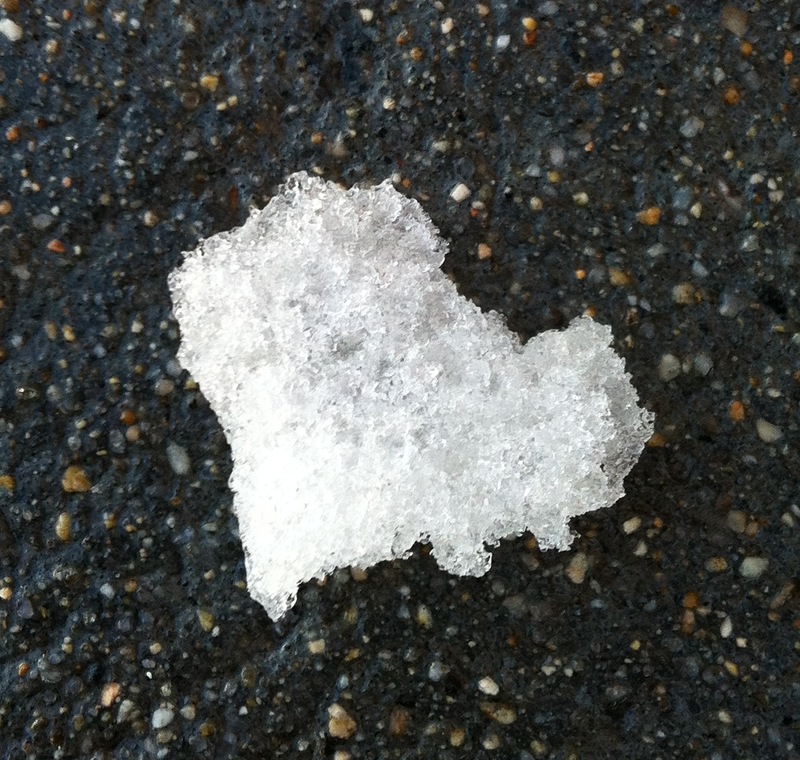 Using my boots to make a giant heart in a field of freshly-fallen snow. Getting to know the bus driver through weekly morning commute conversations. Hallway high-fives. 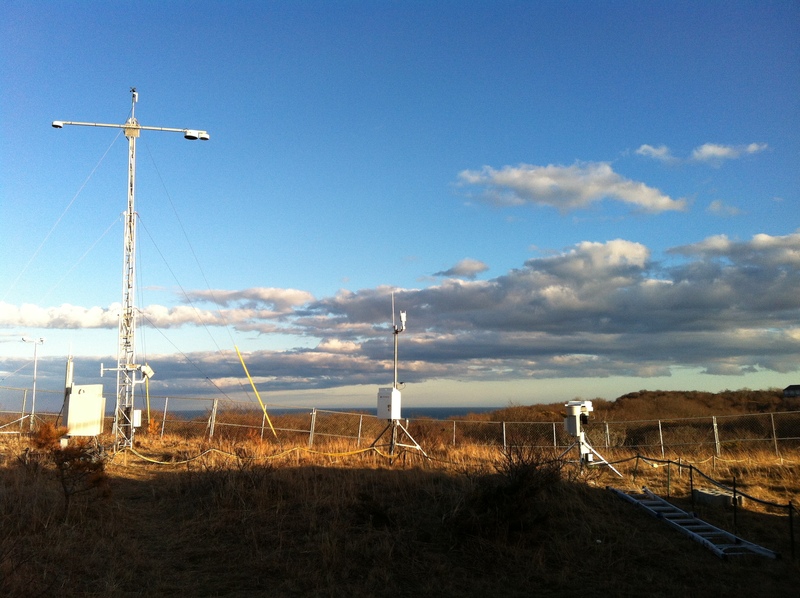 Discovering simple fixes to potentially time-consuming problems with the field instruments. Recognizing your friend’s handwriting on a letter in the mail. Carpool karaoke. Skype dates with best friends and phone calls home. And these cookies, which smile right back at you. And have crunchy peanut butter oatmeal edges and soft centers. And are filled with a creamy, delicious layer of Nutella. 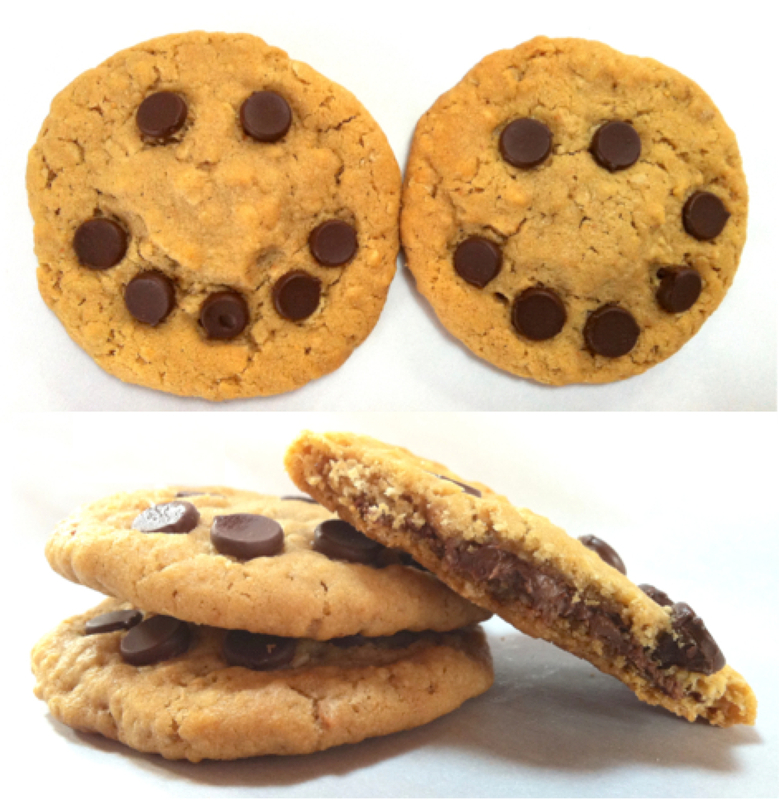 Yes indeed, these cookies are something to smile about! 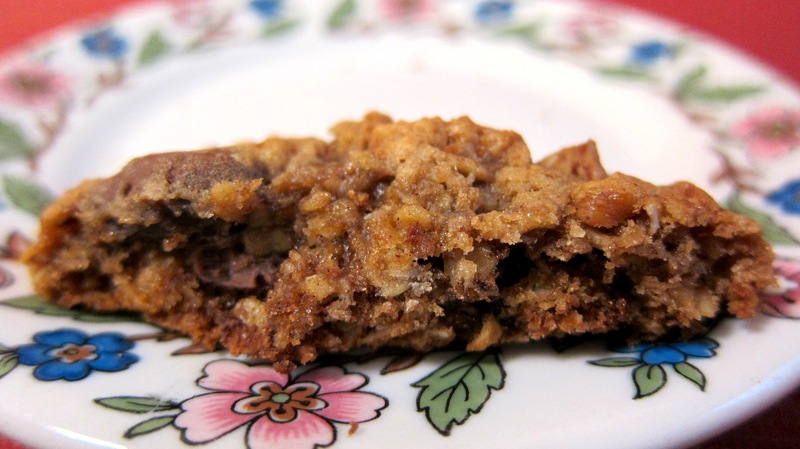 I adapted this recipe ever-so-slightly from Not Your Momma’s Cookie. I added extra butter to avoid buying shortening (we’re only in this house for a little while and wouldn’t use it all). Also, because the batter seemed too wet/weak and knowing that the butter-for-shortening substitution would make the cookies spread more, I added an extra 1/4 cup oats to boost structural support. The balance between the oatmeal, peanut butter, Nutella, and a few chocolate chips is perfect. Make these; they’re a little bit of work but nothing too crazy, and the payoff is well worth it. Trust me, one bite is all you need to fall in love with these sweet faces! 1. Cover a cookie sheet/pan/large flat plate with parchment or wax paper. Using a teaspoon, scoop 25 balls of Nutella onto the paper. Freeze for at least 20 minutes. 2. Preheat oven to 350 F. Prepare a cookie sheet by covering with parchment paper. 3. In a small bowl, whisk together the flour, baking soda, and salt. Set aside. 4. 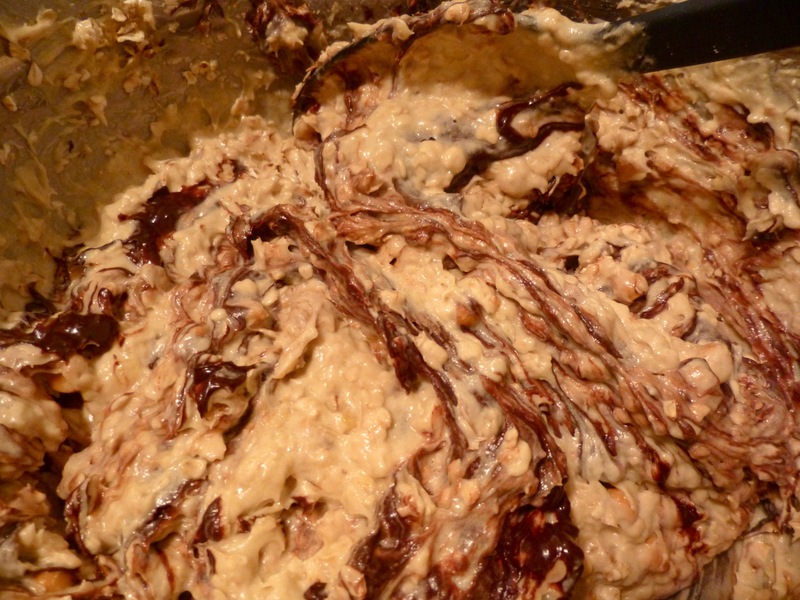 In a large bowl, use an electric mixer to cream together the butter, sugars, and peanut butter. Add the egg and vanilla; stir until combined. Add the dry mixture in thirds, stirring just until incorporated each time. Gently stir in the oats. 5. Take about a quarter-sized scoop of dough and flatten it into a mini pancake in your palm. Place a frozen Nutella drop into the center and fold the edges of the batter up around the Nutella until no Nutella is exposed. Gently shape into smooth, slightly flattened balls. Place on cookie sheet about 2 inches apart. 6. Press in chocolate chips in the shape of a happy face. Since these cookies will spread quite a bit, put the smile’s chips right next to each other and the eye’s chips far away from the smile. 7. Bake for 10-12 minutes, until edges are lightly browned. Remove from the pan to cool. The chocolate chips will stay soft for a while, so wait a few hours for them to harden before you try to store these or you’ll mess up all the faces! The Nutella drops need to be in the freezer for at least 20 minutes before you try to use them or they’ll get all over your fingers. Right after you take them out of the oven, pop them off the paper. Then when you’re assembling the cookies, it’ll be easy to pick up a drop instead of trying to pop one off every time. You’ll have to keep re-freezing them, too, because they soften and start making a mess quickly. Look at how happy they are! I bet it’s the secret Nutella layer inside. That would make anyone grin! Field campaigns require nourishment. Seeing as we are currently residing in a cute Cape Cod house with a rather well-stocked kitchen, clearly we needed to get baking. 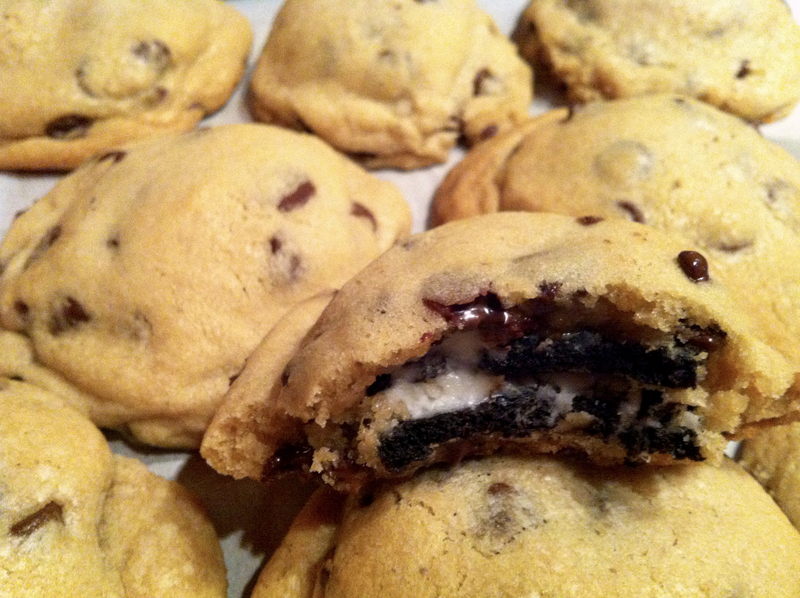 What better than these Oreo stuffed chocolate chip cookies from Picky Palate? Not much, my friend, not much. 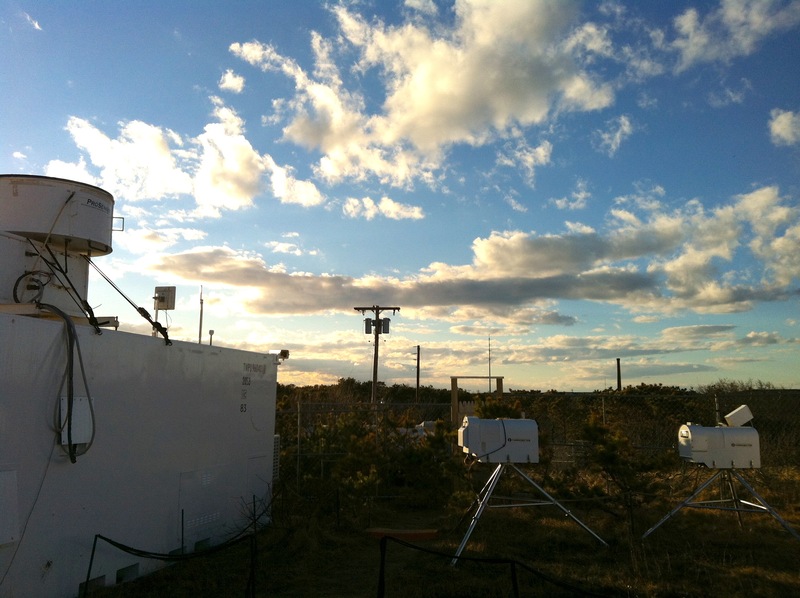 Although these field site views aren’t too bad, either. But then again, can anything really compete with this? Follow the link above for Picky Palate’s instructions. She does such a great job, you don’t need me to recap them here. But you do need these. Get baking!! Also, a hint: for ones that you don’t eat fresh out of the oven, pop them in the microwave for about 20 seconds to get them warm and gooey again! Directions, as I made them, are provided here for ease, but check out the original link for some adorable pictures! 1. Preheat oven to 400 F. Line a cookies sheet with parchment paper. 2. Mix the flour, baking powder, and salt in a medium-sized bowl. 3. In a large bowl, combine butter and sugar; beat until soft and fluffy (at least 2 minutes). Beat in the eggs and vanilla until well-mixed. Add the dry ingredients in slowly and mix until just incorporated. Cover and put in the refrigerator for at least an hour to stiffen the dough. Form dough balls (1/4 cup or less) and flatten into 1/2-inch-tall circles with your hands (you can also roll the dough out with a rolling pin and cut shapes with cookie cutters, if you want fun shapes). 4. Bake for 8-10 minutes, or until just the edges of the cookies start to turn a very light golden brown. Don’t over-bake! These cookies taste much better when they are soft and just done. 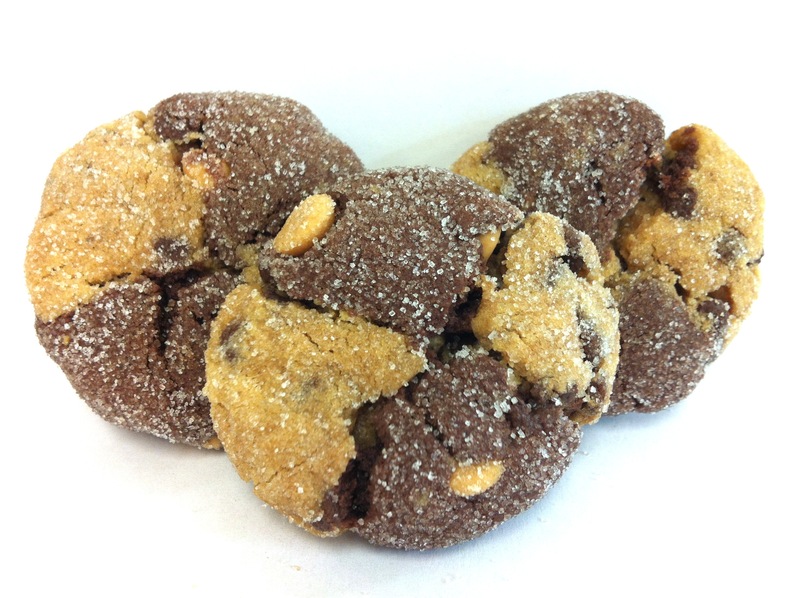 For an extra-doughy consistency, remove the cookies before the edges start to brown. Transfer to a wire rack to cool before decorating. 5. To make the frosting, whisk together the butter, vanilla, and milk. Slowly mix in powdered sugar, 1 cup at a time, until the frosting reaches your desired consistency (you want to be able to spread it on the cookies, but you also want it to hold it’s shape and not drip off the cookies). As you are decorating the cookies, the frosting with slowly harden. Simply add small amounts of milk (<1 tsp. at a time) to bring it back to a spreadable consistency. And of course, decorate with sprinkles as you go. So cute! I have used up the last of my ripe bananas, thank goodness. I have so many other ideas hanging out in my brain, clamoring for attention and getting jealous that I’ve been spending so much time with bananas lately. Nonetheless, I’m excited about this recipe because it gave me the perfect opportunity to use the World Market dark chocolate spread my mom gave me for Christmas. While the spread is good on toast and whatnot, I couldn’t wait to find a way to bake with it. And the opportunity finally presented itself with this recipe idea! Of course, you could use any chocolate spread – including Nutella, like the recipe over at Chef in Training that inspired this post – but I like the dark chocolate because it’s not too sweet, so it doesn’t overpower the other flavors in the muffin tops. Alright. About that. I need to come clean: I adapted the above recipe so much that it’s basically my own recipe at this point, which means I have to take full blame for these should-have-been-cookies. They have a very soft, dense-cake texture. The walnuts give a bit of a crunch, the oats add some chewiness, and the butterscotch and chocolate swirls bring in some much-appreciated sweetness. But ultimately, these don’t really taste like cookies. They’re just too soft/squishy/cake-y. Clearly, I haven’t quite mastered the art of recipe development yet! However, someone in my building took a bite and brilliantly suggested, “Call them muffin tops!” Genius, I tell you. If you eat these as cookies, you’ll wonder at the slightly strange texture. If you eat these as muffin tops, your brain won’t be confused and you’ll like every bit. So, enjoy these muffin tops! This recipe makes about 4 dozen muffin tops; I had to make a big recipe, because I needed to use up 3 ripe bananas. 1. Preheat the oven to 375 F. Prepare a cookie sheet by lining with parchment paper (what I did) or greasing with baking spray. 2. In a bowl, whisk/stir together the flour, sugars, baking powder, and baking soda, and salt. “Cut in” the shortening (see photos below; I used two knifes and keep cutting the shortening, coating it with the mixture, cutting again, coating, etc. until you have a bunch of pea-sized clumps and there’s no “dry” powder left). 3. Using an electric hand mixer, add the eggs, vanilla, and bananas and beat until well mixed. 4. Stir in the oats, walnuts, and butterscotch chips. 5. Pour the chocolate over the dough and gently swirl it into the dough (mix carefully by folding the dough and chocolate together, or use a knife to make grooves for the chocolate – the key is to not mix it together all the way, so you still have some ribbons of color that make it look pretty). 6. Use a tablespoon to drop heaping scoops of batter on prepared cookie sheets. Leave at least 1.5-inches between drops. 7. Bake for ~12 minutes, until the muffin tops are set and spring back from your touch. Immediately remove from tray when done cooking and transfer to cooling racks. 8. Pour yourself a glass of milk and sample one fresh from the oven. You deserve it! Just starting to “cut” in the shortening, using two knifes to make “x” cuts into the shortening. Further along in the process. Be sure you’re coating the cut pieces with the powder mix as you cut – this will keep the shortening from sticking to itself in the center. At about this point, when it’s pretty well mixed and the largest clumps are about the size of peas, I stop using the knives and switch to mixing it in by hand. You want to crumble the dough together, not smoosh it like bread dough. Think of it like you’re picking up sand and feeling the grains between your fingers and thumbs. Do that motion with the mixture to get the shortening to mix in nicely with the powder. What the final shortening + dry ingredients should look like when you’re done cutting and mixing it by hand. 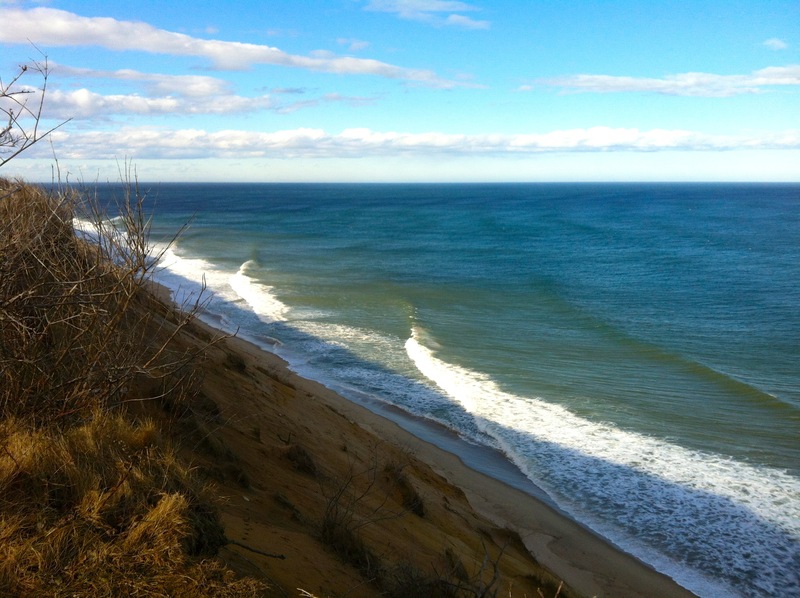 There should be no obviously large sections of dry powder; you want it to look almost like damp, coarse sand. Gently swirl in the chocolate. Do not mix past this point! In fact, I almost think I mixed it in too much. These muffin tops are pretty because they are multi-toned, so don’t get too zealous with the mixing here! Using heaping tablespoon scoops to plop the batter down onto the tray, leaving space for the muffin tops to spread a bit. Cookies… er, muffin tops for everyone!! I love these. Everyone enjoyed them, but I loved them, probably because I’m obsessed with anything that contains peanut butter and chocolate. 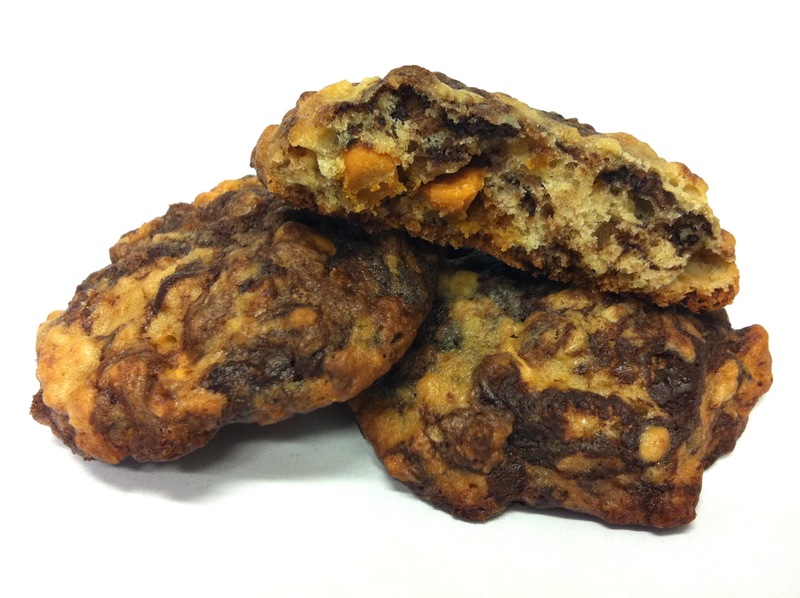 And in this recipe, there are chocolate chips in the peanut butter dough and peanut butter chips in the chocolate dough so anywhere you bite, you’ll get a mouthful of peanut butter and chocolate heaven. I’m also partial to these cookies because they combine two of my favorite cookies growing up: Easy Cake Mix Cookies and Peanut Butter Blossoms. The cake mix recipe came from a good friend in elementary school. Whenever we’d hang out after school, her mom would make us these amazing cookies. Warm from the oven with a glass of milk, these cookies taste like childhood. 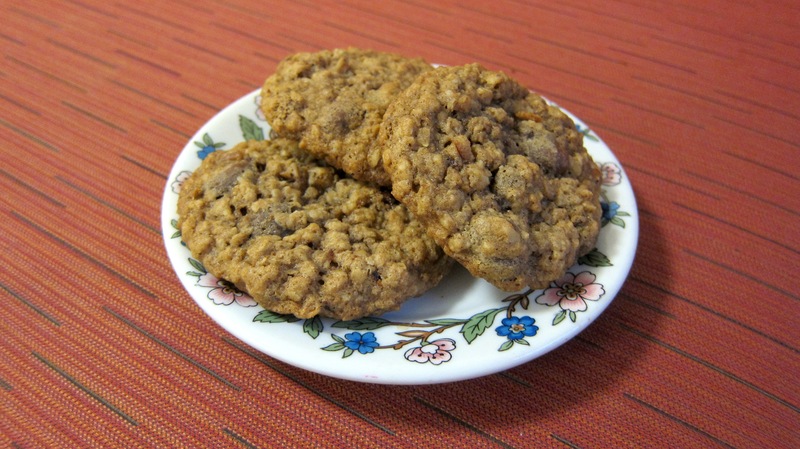 Ever since, these have been my go-to cookies when I need something fast, easy, and delicious. (My friend wrote the recipe card for us back in second grade; at the end, it says in the sweetest little-kid handwriting, “And now you have cookies!” So, so cute.) 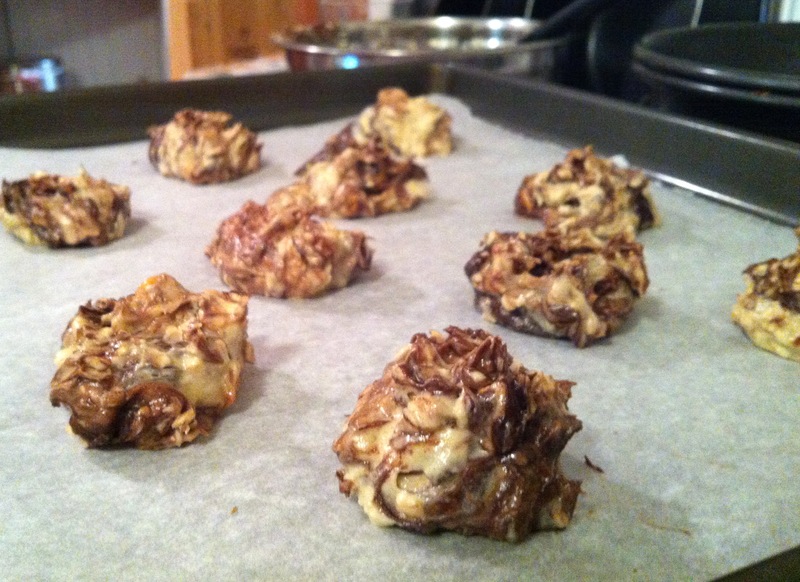 The peanut blossoms recipe came from my mom, who got them from an old coworker. I know there are lots of recipes out there for peanut blossoms. My mom has the best recipe. Really. 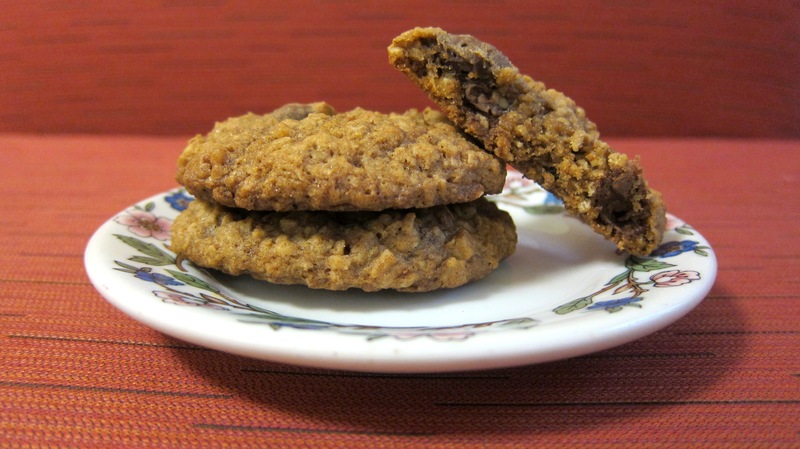 So, with these two cookies coming together to make one super cookie, I highly recommend you give this recipe a try! Mix all ingredients (except for the chips) together, then stir in the peanut butter chips. 1. Preheat oven to 350F. 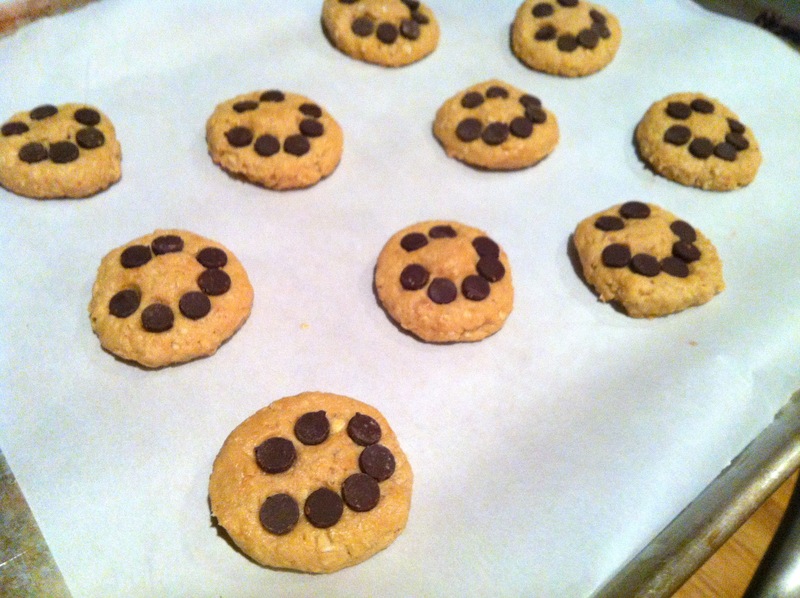 Cover cookie sheet with parchment paper (or spray with non-stick baking spray). 2. Make the peanut butter and chocolate cookie doughs (separately) as detailed above. 4. Take about a tablespoon scoop of the peanut butter dough and a smaller scoop of the chocolate dough (about ¾ of the size of the PB scoop). Roll each of them into a ball (separately) then make them slightly elongated so they resemble a fat baby carrot. Push them together side-by-side then gently tear in the middle so you have two halves with both kinds of dough. Flip one of the halves, and re-connect them so that the chocolate side of one half now matches up with peanut butter side of the other half and vice-versa. Squish them together really well (so they don’t fall apart while baking), and gently shape them into rounded cookies (like a slightly flattened ball). 5. Roll the cookies in granulated sugar and place on the prepared cookie sheet (parchment paper or baking spray). Bake at for 10-12 minutes. The cookies will be soft to the touch. Transfer carefully to a cooling rack to firm up. This was my last chance to bake with Christmas flavors and sprinkles at school for the year. Now that it’s January, I have to switch back to more season-neutral treats. But as I’m posting old recipes, you get these wonderful treats! I made some classic gingerbread cookies to celebrate surviving my first semester of grad school, the approaching holidays, and the amazing people I’ve met here. That final reason is one of my favorite parts of baking: in return for passing out cookies, I received two hours of great conversations. Worth every second of baking for sure! 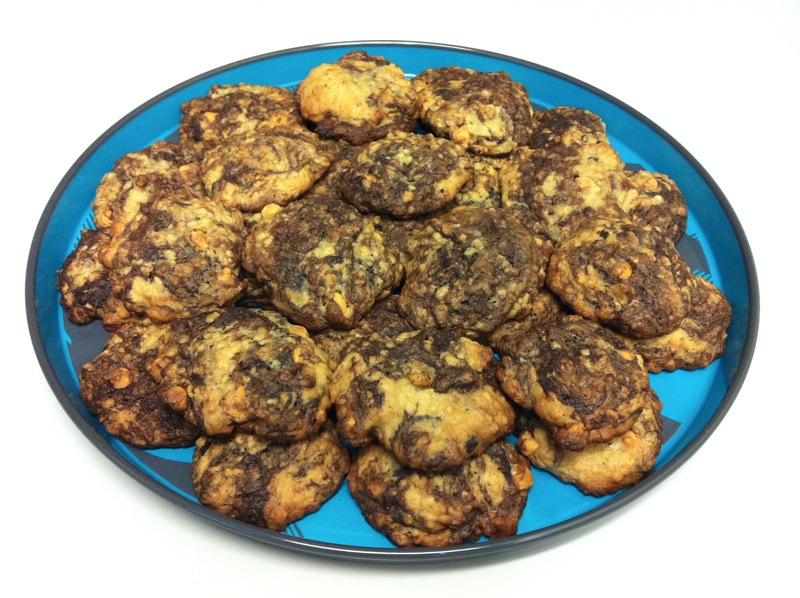 And one shamelessly proud moment: my professor emailed me over break to request this recipe for his family baking. Are you tempted to make them yet?! Okay, enough babbling: what you really want is this recipe. These cookies are great. Flavorful, crunchy on the edges, and soft in the middle – classic goodness. I combined two different recipes with my own ideas and this was the result. If you want to make gingerbread cookies (and don’t have a family recipe that you could never bear to abandon), then definitely try these! *Orange juice is the secret to making really awesome gingerbread. If you have a different recipe that you insist on using instead of mine, I won’t mind – but please trust me and substitute orange juice if your recipe calls for water! Or, do what I do: add the orange juice to the recipe and bump up the flour & spices to make up for the additional liquid. Orange juice brings out the flavors and will make your gingerbread extra awesome. I promise. 1. Divide the dough into thirds, wrap with cling wrap, and then refrigerate for an hour before rolling the dough out. 2. Refrigerate the cookies again for 5 minutes (or more) before baking them. Then you won’t need to leave 2 inches between each cookie when you bake them, because they will retain their shape better. 3. If you don’t have parchment paper (darn you, Shaws, for running out! ), coat your pans with baking spray and your cookies will be fine (just a bit darker on the bottom). 4. 10 minutes is key! Don’t bake them any longer! 9 minutes might even be enough. Or 8. Find out how your oven cooks and be careful not to overcook these or they’ll be crunchy all the way through. 5. If you’re impatient like me, you don’t have to let them cool on the baking sheets for 10 minutes. They’ll be fine being transferred immediately to the cooling racks (they’re just soft, so be careful – they’ll harden up later). 6. Decorate with frosting! A very simple recipe that I used = 1 cup powdered sugar for every 1 tablespoon water (I ended up using about 5 cups of powdered sugar to decorate them all). Add water as needed, in very small amounts, to keep it smooth enough to spread. Too runny, though, and it will not stay on your cookies! 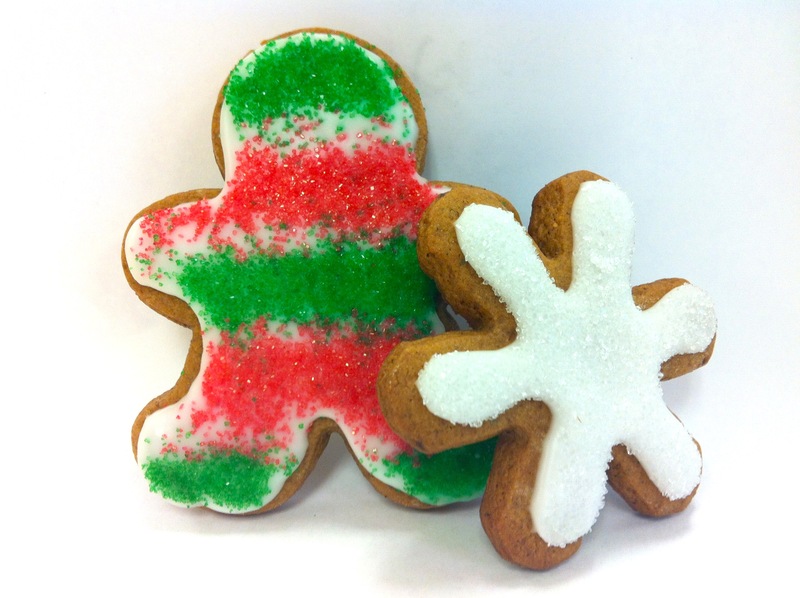 Find that sweet spot that allows you to spread it with a knife (like on the gingerbread men) or pipe it out with a frosting bag (like on the snowflakes). 7. Use the crystalized sugar sprinkles instead of crunchy/harder sprinkles. The crunchy ones will distract from the gingerbread’s texture. 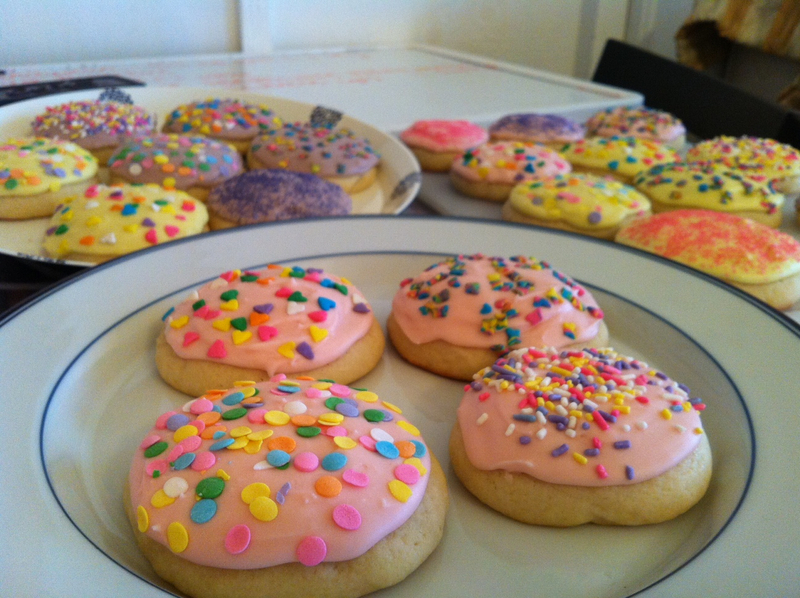 Put the sprinkles on immediately after you frost each cookie, or else it’ll harden and the sprinkles won’t stick. 8. Let the frosting harden overnight. Store the cookies with wax paper between each layer. The less stacking you have to do, the better, because they’ll get a bit smashed if you stack them too high.